Florida Seafood Festival – Apalachicola Florida – Florida's Oldest Maritime Event! The Florida Seafood Festival is a two day event annually drawing tens of thousands of visitors to the historic town of Apalachicola in scenic Franklin County. 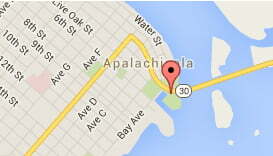 The Festival is held at the mouth of the Apalachicola river under the shady oaks of Apalachicola’s Battery Park. The festival features delicious seafood, arts and crafts exhibits, seafood related events, Musical Entertainment. Some of the notable events include Oyster Eating and Oyster Shucking contest, Blue Crab Races, Photo Contest, Parade, 5k Redfish Run, The Blessing of the Fleet, History of the Festival Exhibit and Tonging For Treasure. The Florida Seafood Festival would like to thank all of our Commodores! If you or your business would like to be a 2018 Commodore click here and see what wonderful advertising and sponsor gifts we provide to our Commodores.